I am not a fan of my hands. In the words of Pooh Bear they are short and fat but, unlike Pooh, I am certainly not proud of that. I think they look a little like a cross between shovels and sausages. If you don’t know me I’d love to know what sort of image you have in your head right now. I have never really been overly fussed on painting my nails as it tends to cause a little bit of attention and I like to hide my hands at every opportunity. Having said that, if I am going out of an evening, I always feel a little incomplete until my nails are painted. It just finishes an outfit I think. I’d never worry about wearing nail paint on a day to day basis although maybe I probably should make the effort….?! It does seem a little futile to spend a good hour painting and drying your nails only to then have to clean the bathroom or wash the dogs bowls up. Anyway, enough hand hate. 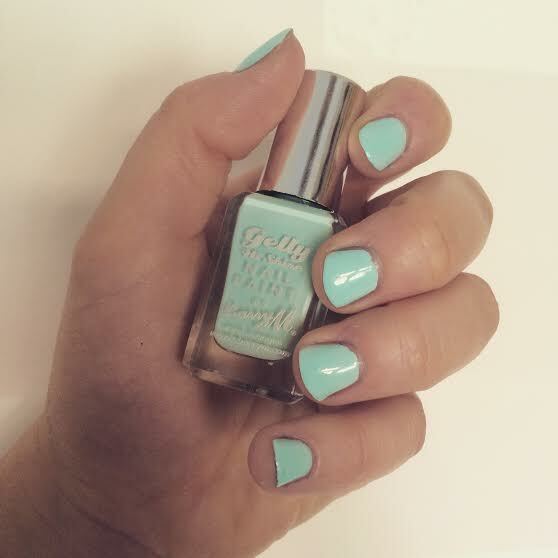 This week I tried a new shade for me, it was the Gelly Hi-Shine Nail Paint by Barry M in the shade Sugar Apple. I’ve seen various beauty bloggers raving about minty nail paints from Topshop, Essie and the like and so I saw this one in Boots the other day and used the points balance to treat myself to it. It advises that you use a base coat before applying but I only had a top coat to hand so I whacked a bit of that on….aren’t they just the same anyways? The first few strokes of the nail paint were a little patchy looking and immediately I wrote it off as rubbish but persevered. I was then pleasantly surprised. As the nail paint sort of spread over my nail plate and dried it looked a lot more even. I allowed the first coat to dry, with a good technique you could get away with one coat, then went over with a second coat. I was really impressed with the end result. I always prefer darker shades for my short nails but I think although this is a pastel it’s a really thick and pigmented sort of formula so it doesn’t leave my hand looking washed out. It’s not shimmery either, it’s just a lovely glossy colour. The nail paint retails at £3.99 and I think that it’s pretty good value for money. Do you wear nail paint religiously or strictly for nights out?